Dialogue between the different traditions that claim the term “evangelical” hasn’t always been gracious or effective. In both history, as well as my own experience, sometimes when different “denominations” talk, they often talk past each other. How can those who claim to be “evangelical,” which I would assume means there are some shared beliefs, not be interested in partnering together? Imagine sitting in a room where six denominational representatives were able to talk clearly, graciously, and lovingly about their traditions and distinctives while also talking about their shared unity? Thankfully, there is a new book that helps us reflect on these questions while focusing on the unity and differences that evangelicals hold. 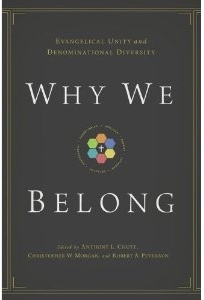 Why We Belong: Evangelical Unity and Denominational Diversity, edited by Anthony L. Chute, Christopher W. Morgan, and Robert A. Peterson attempts to tackle this provocative subject. So the authors believe that there’s a positive way to view denominations while also maintaining the tension between having differences and commonality. This is a worthy goal in itself, I think. After the introduction, Why We Belong offers two chapters setting the foundational tone: Morgan’s “Toward a Theology of the Unity of the Church” and Chute’s “One Lord, One Faith, but Many Expressions: Denominations and Their Stories.” Both chapters are quite interesting and, as far as I’m concerned, help lead readers into the subject matter both biblically, theologically, and pastorally. Morgan’s essay should be read by all pastors because it lays out an extremely well argued case for the unity of the Church. Much of his discussion centers on how Church unity is a way of showcasing or displaying certain concepts, characteristics, and qualities that people can tie back to God. For example, he writes how the unity of the church showcases God’s purposes of cosmic unity and how unity of the church displays the unity of God. He writes how unity of the church is both a current characteristic and a perennial pursuit as well as how unity of the church fosters and is itself fostered by love and humility. Finally, he writes how the unity of the church is both an important doctrine and an important praxis. One of the ideas that Morgan writes that demands much reflection is when he writes that “church unity is a meaningful concept only in terms of genuine Christianity” (p.33). When we begin discussing “genuine Christianity,” we must begin to ask questions related to just what exactly is “genuine Christianity”? And how can we determine what is orthodoxy? I’m inclined to refer readers to G. K. Chesterton’s Orthodoxy but also believe this issue to be rather important when discussing how we’re united. In my reading, I think Morgan does a good job of laying out what true Christian unity is and what it isn’t or what it shouldn’t be. Chute’s brief, and I do mean brief (28 pages! ), lays out a simple “history” of church denominations, specifically those that are featured in this book (Anglican, Baptist, Lutheran, Methodist, Pentecostal, and Presbyterian). It’d be a great chapter to discuss with advocates of these Christian traditions because it, generally speaking, creates some gracious talking points. Interestingly, throughout the brief histories, one walks away sensing the tension between unity and diversity as we read about how even within these traditions, there are differences! For example, there are differences historically between Pentecostals on issues related to Spirit baptism and glossolalia (speaking on tongues), Presbyterians on certain aspects of the Lord’s Supper, and Baptists on free-will and predestination (Arminianism and Calvinism). Yet, as is obvious, there’s still unity. The next six chapters are written from different authors covering their respective tradition. Gerald Bray writes on Anglicanism, Timothy George writes on Baptists, Douglas Sweeney writes on being Lutheran, Timothy Tennent writes on being a Methodist, Byron Klaus writes on being Pentecostal, and Bryan Chappell writes on being Presbyterian. Informed readers will recognize all of these names as being excellent picks to represent their denominational traditions. There were also some helpful challenges offered by different authors to their fellow evangelicals that I found interesting. Each lays out a case as to why they share unity in evangelical identity as well as diversity as they differ on certain doctrinal and practical matters. I’m not going to provide detailed interaction with these chapters, but will suggest that readers give each a fair read. You might walk away having a bit more respect for a tradition than you had before. In my case, I enjoyed Tennent’s chapter on Methodism, especially his discussion on “sanctifying reorientation of the heart.” I was left with the impression that there still are some very “evangelical” Methodists out there, despite what I have experienced in past discussions. This was encouraging, to say the least! Finally, the book ends with a chapter by David Dockery, “Denominationalism: Historical Developments, Contemporary Challenges, and Global Opportunities.” This chapter presented some keen observations and also left me hopeful of the future of denominations working together and, most importantly, continuing the Missio Dei. What I liked about this book is that it is pretty comprehensive for a single work. I’m hard pressed to imagine that representatives of any of denominations discussed will feel misrepresented or frustrated by how they are identified. In fact, even though my own denominational affiliation didn’t have a chapter (Vineyard), Klaus’ chapter on Pentecostalism mentions it and does a good job of laying out some of the differences. This was true of all of the chapters. In the end, I’d recommend this book to anyone who is thinking through issues related to evangelical identity, Church unity, and denominational distinctiveness. I have to be honest, i got tired of defining and then redefining evangelicalism to always include myself, so i’ve decided to dump my evangelical identity. It has been freeing 🙂 …. now i just focus on theology. The phrase you brought up “sanctifying reorientation of the heart” is interesting. I have been thinking of that lately. Samuel, I understand that perspective… lots of people are moving away from using the word “evangelical” because, as you obviously know, it carries a lot of baggage (some good and some bad).